Contextual feedback is crucial for remote teams working online to have fast and efficient feedback system. Asking and taking feedback is tedious and usually happens off-context using email and text message. There are some tools, however, that allow teams to discuss things and collaborate online in much better way. Web Annotation and Markup tools help you to comment, discuss and collaborate right on web pages or screenshots or PDFs. Such tools add context to the content and make use of highlights, sticky notes, comments, etc. for making discussions with context. In this post, we’re showcasing the best yet freely available tools for contextual feedback. These tools let you annotate, comment and discuss on the web Ã¢Â€Â” quickly and easily. Scrible helps building your own online library of annotated articles or research materials and owing to the same, it’s a perfect tool for researchers and remote teams. It allows you to save and bookmark pages, save files (docs, presentations, etc. ), create and search your library, and share the annotated articles with others for getting feedback. Scrible offers bookmarklet and an extension for Chrome. On any page, you can click its bookmarklet or button to activate Scrible Toolbar. Once it’s there, you can select text and press “Highlight Text” to highlight text in various colors or click “Add Note” to add a sticky note. “Bookmark Page” and “Share” buttons perform as expected and you can share the annotated page using Permalink in case you seek feedback. On visiting that link, others would see a similar toolbar, using which they can comment, highlight, add notes and tags, etc. Diigo is a reading assistant that lets you build your own research library and that’s why, it suits well for bloggers and remote teams. This tool allows building shared knowledge repositories by sharing libraries with groups (say classmates or colleagues). The group members can view as well as add annotations to the shared materials. Diigo offers bookmarklet (called Diigolet) and a Chrome extension. Upon clicking the Diigolet or Diigo button, you’d see Diigo Toolbar on top-right of the page. You can use “Highlight” button to highlight text in different colors and click “Sticky Note” to add notes. The toolbar’s “Bookmark” and “Read Later” buttons work as expected. For sharing the annotated article, click “Share” and choose “Get Annotated Link”. Using this link, people can see your highlights and notes but can’t add their own (use group sharing for same). Pundit Annotator is a much simpler annotator (than the above tools) and packs in just the necessary features for a solopreneur to grab ideas from the web and add comments. It provides only a Chrome extension (and not bookmarklet unlike others). After installing its extension, you’d see its button beside address bar. On any page, click it to bring the “Pundit Sidebar“. Then after, you can select any text on the page and you’d see two options/buttons: “Comment” and “Highlight” (both of these work as expected). For checking out your annotations, you can login to your account and browse “Notebooks“. Hypothesis is developed with the mission to Ã¢Â€Âœbring a new layer to the webÃ¢Â€Â, and in fact, it does its job very well. It’s a simple tool like Pundit Annotator that offers a bookmarklet, a Chrome extension and even allows entering a web link for making annotations directly. The tool allows creating groups (even public ones) to share the annotations with others and building a shared annotations repository. Its link sharing doesn’t work as of other tools and shares only the page you’re annotating, and the other person needs to be in same shared group to view or comment on the annotations you’re saving on the shared page. Upon clicking its bookmarklet or button, you’d see the “Hypothesis Sidebar“. Now, you can select any text on the page and you’d see two options: “Annotate” and “Highlight“. These functions let you add comments and just highlight the text respectively. Notable is an easy collaboration tool with superb sharing and feedback options. You can make teams to share the annotated images or screenshots with your group easily. It allows uploading images and capturing URLs (doesn’t work well, though) for adding annotations. It also offers extensions for Chrome, Firefox, IE and Safari browsers. After installing its plugin, open the page you wish to annotate, and click “Notable” button and choose one of “Capture Visible Screen” and “Capture Entire Page“. After processing the shot, you’d be presented the chosen page with “Notable Toolbar” on the top of the page. Now you can select any area of the page and add your comments. Click “Share” button from the toolbar to share the annotated page. Notable allows sharing via email or you can also directly share the given link with your friends or colleagues. You can even download the annotated materials as PDFs to discuss or present them offline (premium feature). Genius Web Annotator is just as simple to use as AnnotateIt (above). It offers a Chrome extension and a bookmarklet for creating annotations. You can login to your Genius account to check your annotations and therein, you can also use the “Share” button to share an annotation via link or via Twitter or Facebook. 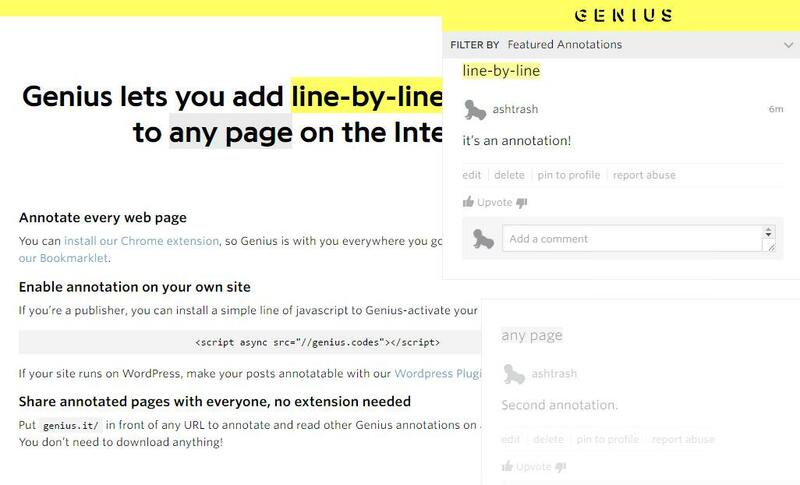 While you’re browsing any web page, click the Genius Web Annotator’s bookmarklet to load its annotation tool. Then you can select any text on the page and click the Annotate button to add your comments. Here are few others that didn’t quite make the list, but might interest you. Twiddla – An online whiteboard for groups that want to brainstorm together. You can annotate websites, graphics and images all while browsing the web together. Wired Marker – A permanent highlighter for the web. Highlighted text is saved as bookmarks and can be organized into folders. That’s all folks about web annotation and markup tools. How do you plan to use these tools to improve your team’s productivity and make contextual collaboration? Do you know more such tools worth mentioning in this list? Do let us know using the comments. The post 7 Free Web Annotation and Markup Tools You Should Know appeared first on Hongkiat.